And I am not getting things done. I have a desire to redecorate! I made this mini for my grandmother. And sent it a few days ago. 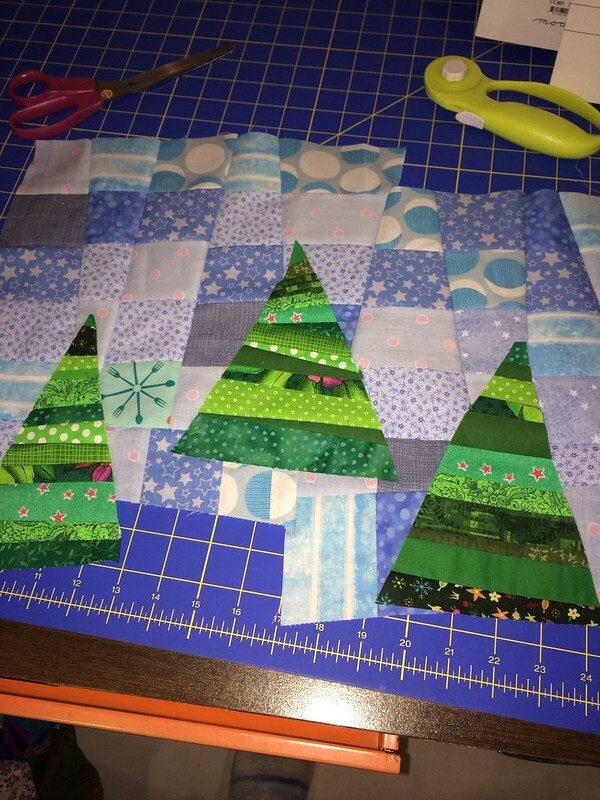 The trees are improvisationally pieced. 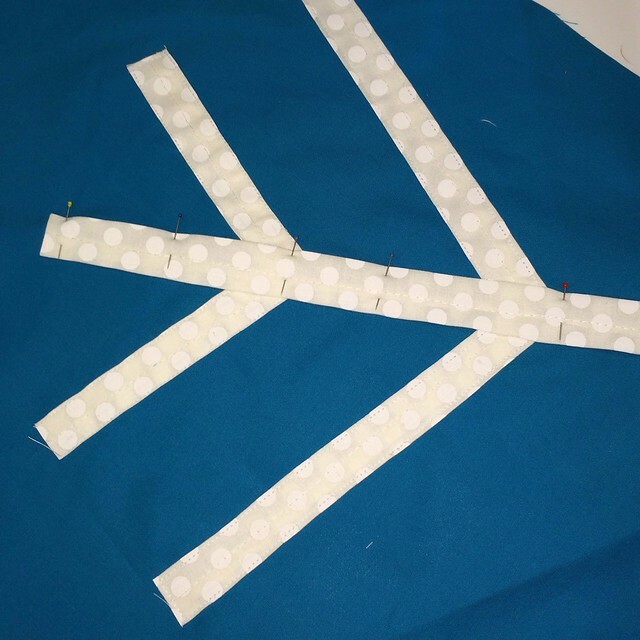 - Basically, cut some strips - 2-3 inches wide, doesn't matter, sew them together, in groups of three, then slice up the middle piece, sew it to some other strip, and keep slicing them apart and sewing them together until the pieces are all skinny and mixed up. The sky is similar, except it was cut vertically instead of horizontally. I am making a second one for myself, though instead of piecing the trees into the background, I've decided to applique them instead. Mine will be a pillow cover. I am planning on getting four done for my four windowseat pillows... eventually. One a star, one a creche, and one with gingerbread men. Or maybe a nutcracker? Alright, I'm not entirely sure. Or maybe I need a fifth pillow? And speaking of eventually, Thursday night, I took a class with Debbie of Esch House Quilts to make her modern snowflake tree skirt. 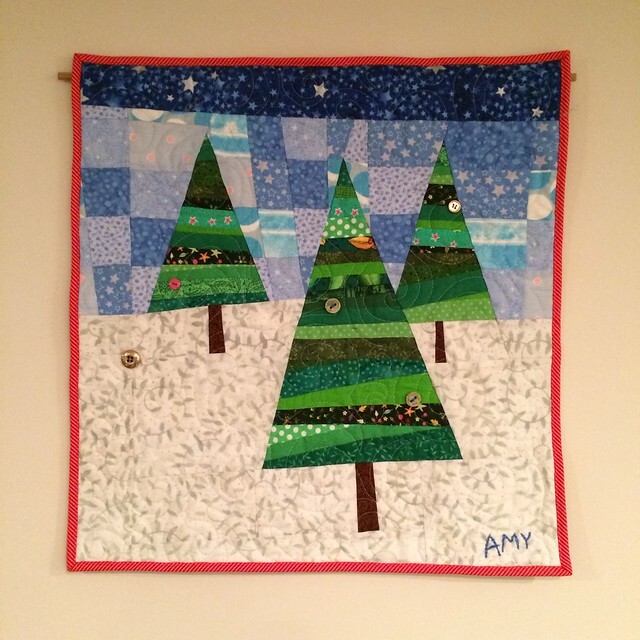 I feel like this tree skirt, and the pillow covers, and many other ideas I have had, may end up like that wreath I wanted to make last year - I put it in a box after Christmas last year, and put it away with the Christmas decorations, and said, maybe next year! Of course, I pulled it out this year, and put it right back again, thinking, maybe NEXT year! So, I hope that does not happen here. I've got the tree skirt out where I will work on it - I would rather put it away finished than in pieces. And since we're snowed in today, that will give me lots of time to sew, right?